That bowl fits only about 2/3rds of the bag, so there is more popcorn goodness unpictured. Three ounces may not seem like a lot, but this is a snack that should be savored in small doses rather than inhaled in a matter of minutes. I was nervous about doing this review because (a) I’m not a fan of mushrooms, though of course, I’m a curious enough foodie to try them again on occasion and (b) I’ve rarely found that all those truffle-oil dishes running rampant in restaurants live up to the hype. Partly, I’m sure, because of reason (a), but also because I can rarely taste the truffle’s presence. I did not have that problem with this popcorn. Let me tell you, the smell was AMAZING when I opened it. Very warming, and it reminded me of a za’atar seasoning blend, which is a mix of earthy herbs like sumac and sesame seeds that has a bright undercurrent from marjoram and dried citrus. I already told you how powerful the smell was, but the taste? Even more so, and only in good ways. My first few kernels, I worried that there was too much flavor, that I wouldn’t be able to eat more than a couple, and that the mushroom flavor would be too prominent for me. That concern faded fast as I became more addicted to them with each handful. They didn’t remind me of the rubbery mushrooms I despise but rather the deep, rich, woodsy mushrooms that can give beef dishes a luxurious depth. Each kernel was heavily dusted with a blend of yeast, two different types of truffles, truffle extract, and truffle salt. Needless to say, there was no skimping on the use of truffles, and why would you when you have 200 acres of them? My mental connection to the za’atar spice blend persisted for my taste buds as well. The aftertaste left my tongue with a fleeting, velvety coating. My husband also enjoyed the popcorn, calling it “interesting”, which is practically verbose for him when discussing food, and eating the remaining two-thirds of a bag after I’d had my fill. Although I’d recommend only having a little at a time to honor the extravagance of its flavor, he was not inclined to exercise such restraint. Susan Alexander’s Truffled Popcorn is a worthy indulgence, even if you aren’t a mushroom fan. I think I’ve finally learned what the truffle hype is all about. 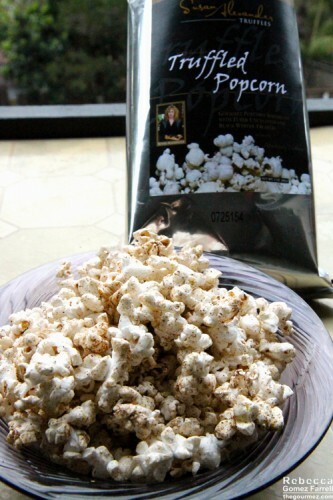 You can purchase the popcorn for $8 a bag from their online store (Click here!). Other products include truffle oil, whole truffles, truffle butter, and truffle sea salt and pepper.